In The Millennium Matrix, Rex Miller writes, "Although individual churches seem committed to being all things to all people, most businesses learned years ago that such a strategy eventually leads to disaster." (pp. 164-165) Miller notes that smart businesses focus on their "core competencies," the unique and superior skills that define their organization. Someone shared an article with me a couple of years ago on "the Outback Steak-Church." Outback Steakhouse does dinner and does it well. In most locations (Oak Ridge is an exception), they just do dinner. The idea is the same one that Miller articulates--know what you do well and stick to it. One church cannot be all things to all people. Different churches are more gifted in some areas than others, just as believers are gifted in different ways. Miller's idea is that churches need to find ways to work together and complement one another so that the larger mission of God can be actualized in the world. What are the implications of this for an organization like the Tennessee Cooperative Baptist Fellowship or the Cooperative Baptist Fellowship? I think it says that we need to stop and consider where we are most gifted. We are not and cannot become a "full-service" denomination, and many churches are no longer looking for that kind of service. So what do we do well? You will have your own response, but I think we do "relationship" well. Now, is that a product? No, but it is something for which individuals and churches hunger. We ARE a "fellowship." Let's build on that strength. After a week visiting Virginia's historic triangle, I have to say that these folks know how to do it right. Colonial Williamsburg, especially, has found a way to make history interesting to people who are not usually involved in the study of history. From the buildings (preserved, restored, or reconstructed) to people (trained and motivated reenactors), the historical events and persons become real to visitors. It is an interesting combination of education and entertainment (some would call it "edutainment") that goes down easily. While I was talking on the shuttle bus with a lady from Maryland, she shared what she considered a high compliment: "It's like a Disney World experience!" Actually, it was better than that and more historically accurate! Those of us who are religious educators could learn from this example. How do we help people feel and experience the truth of gospel? I am not just talking about recreating biblical stories (I am not encouraging a "Bible Park" approach), but how can we engage the senses of our people as they reflect upon the gospel? When we fail to use all of the senses in our education, we are failing to take advantage of everything at our disposal. Let's think about ways to make our formation process "real." Rita, Noah (our grandson), and I have spent the week immersed in history--Williamsburg, Jamestown, and Yorktown (as well as swimming and gift shops). 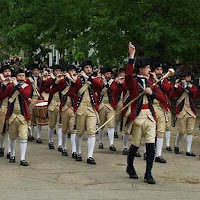 In all three parts of the "historical triangle," the story of three aspects of American history are told well--Jamestown, the first permanent English settlement; Williamsburg, the capital of the "old dominion" of Virginia and site of early rebellion in the southern colonies; and Yorktown, the decisive American victory of the Revolutionary War. Attention is given to historical detail, political sensitivity, and "edutainment" (making the educational as pleasant as possible). Although a great deal of effort is made to show the contributions of different races to the emergence of the American nation, there is no way to hide the fact that at least two of those races had no choice about the matter. English, Dutch, Germans, and other Europeans came in hopes of a better life, fortune, or freedom of or from religion. When the Jamestown Settlement was established, most men of the lower class in London did not live past the mid-20s. Going to the edge of the world in hopes of finding a better life was not a difficult choice under those circumstances! The same was not true for the Native Americans and African-Americans. The indigenous tribes alternately welcomed and fought the Europeans, but their "guests" were not going away. The Africans were property to be bought and sold. They had no choice in their location or vocation. Neither of these groups were full participants in the process of the emerging American identity. I assume that my ancestors (at least the white ones) were probably sharecroppers and minor merchants, but they were not innocent. They did not perpetuate the abuse of others, but they lived with it and benefited from it (and, in turn, so have I). So, does this make me proud to be an American? Well, in a way it does, because we have come to know better. We have grown into a country that tries to embody the ideals stated in its founding documents. We have recognized our sin and are trying to overcome it . . . or are we? Have we gone too far down the road of exclusion and privilege that we can't absolve ourselves of our sin? It is easy to look back on history and wonder why things could not have been done in a different way, but nations are like individuals. We are not omniscient. We try, we make mistakes, and we try again. At least we have the chance to attempt to find better ways. Thanks be to God! I am a Facebook addict. I got started last June and now have over 200 friends on the site. Most of these really are friends—people I know and work with now and many from the past with whom I have reconnected. I started it as an experiment in social networking and have enjoyed the way it has put me into contact with many folks that I rarely, or never, see in person. Facebook provides a number of applications. One must pick and choose carefully what to include for the personal profile. One application is called “My Church.” If you subscribe to this application, a nice logo will be added to your profile identifying you with a particular denomination. There is one for “Cooperative Baptist Fellowship.” Several of my friends have added this, but I have chosen not to. I have been wondering recently why I have resisted taking this step. One reason is that I hold to a rather archaic idea that there is really only one “Baptist denomination.” Certainly, we have divided up into different camps over real and imagined differences, but there still seem to be some basic things that hold us all together (and I won’t get into that right now, since once you put a stake down on what those things are, somebody is going to come up with an exception—perhaps that’s the one thing that Baptists agree about). At any rate, I would like to try out being an adjective-free Baptist for awhile, as less when it comes to be part of a “tribe” of the Baptist family. Second, I really believe the stance that we have declared for so long that CBF is not a denomination but a fellowship or at least “denomination-light.” I am not sure how long we can hold on to that idea as we add more structure, staff, and programming to the organization, but I think there is some strength in this position. Third, this may be heresy for an employee of a state CBF organization to say, but I am not sure that we really have come up with the best answer to how we as Baptists are going to work together in the future. As national CBF continues to go through a “time of discernment” in the next few months, perhaps we will come out with a clearer idea of what we may become, but I don’t think we have found it yet. Is this scary? Yes. Is it realistic? Yes. The world continues to change around us, and we need to be discerning of the times. So, as far as denomination goes, I guess I will just continue to call myself a Baptist for now, and leave that application off my Facebook profile. About the only time I think about my Native American heritage is when I fill out one of those forms that asks your racial identity. Although I always check "Anglo" or "Caucasian," I stop and think about my great-grandmother who was a full-bloodied Creek Indian (at least according to family lore). That would make me one-eighth Native American if my calculations are right. Last Saturday, my grandson Noah and I went on a mini-journey to consider our Native American heritage. We attended an annual "pow-wow" or Native American Festival at Middle Tennessee State University. We saw some colorful costumes, met some interesting people, watched some ceremonial dancing (which Noah described as "boring"), and did some shopping at various booths (Noah liked the shopping best). The life of Native Americans today is complex. I am no expert on these matters, but it appears that as the European settlers tried to impose themselves on the native population, there were several stages: first, Native Americans held onto their basic culture, but tried to get along with the settlers; second, this was not good enough for the land hungry settlers, so the natives either fought or moved; third, the settlers had better weapons than the natives, so the settlers eventually exercised their power over the natives; fourth, the natives went to ghettos (reservations) or assimilated to the culture (as my grandmother did in marrying a white man). I know this is over-simplified, but it starts me to thinking about how one culture engages another. It is difficult for two cultures to co-exist. When they confront each other, are the only alternatives violence or subjugation?. When it came to the Western religious culture (read Christianity) engaging the Native American religious culture, the story was the same: convert or face the consequences. Are there lessons we can learn from the mistakes of the past as the Christian faith engages contemporary culture(s)? And, yes, there is more than one contemporary culture at work in our nation today. Can we identify what are the core values of the Christian faith and separate those from a Western point of view? If we had it to do over again, could our forebears have found a way to mesh the Christian faith with Native American heritage? Surely there has to be a better way.